I can’t believe it’s already August! Here are some affordable weekend options for the very first weekend in August! Enjoy! Brooklyn Boulders: Now until Saturday, August 3, 2013 at Brooklyn Boulders in Somerville. 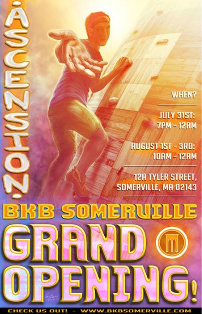 Brooklyn Boulders is celebrating their grand opening in Somerville with free climbing, music and more! Pet Palooza Featuring Dock Dogs: Saturday & Sunday, August 3-4, 2013 from 10am-5pm at Assembly Row in Somerville. Check out two days of pets and play with this fun event at Assembly Row! Free + whatever you purchase. Magic 106.7 Family Film Festival: Saturday, August 3, 2013 at Prudential Center South Garden at sunset. Enjoy a free showing of The Muppet Treasure Island on the South Garden at the Prudential Center at sunset. Bank of America’s Museum on Us Weekend: Saturday, August 3, 2013 & Sunday, August 4, 2013. Bank of America & Merrill Lynch cardholders can get into select museums the first weekend of every month for free by showing their bank card (per cardholder, not family). Museum of Fine Arts, MIT Museum and other museums across the state participate. Patriots Training Camp: Saturday, August 3, 2013 at Gillette Stadium in Foxboro with (free) open practice from 9am-11:30am. If you are looking for Pats merchandise, you may want to swing by the Pro Shop this weekend to take a look at their tent sale with hats, shirts & more starting at $5. Gospelfest: Sunday, August 4, 2013 at City Hall Plaza from 5-8pm. Enjoy gospel music and more at this 13th annual event, featuring headliner Fred Hammond! Free and open to the public. Let me know if I missed any fun and free events for this weekend! I hope you have a great weekend!